I like a good crime series, and there are a few historical ones in my collection. I have lately been sick with a ferociously filthy cold, and this is what I can bear to read when I’m stuck in bed for days on end, sneezing and coughing and feeling like death. It’s not too hard on the brain, but there’s enough going on to keep you awake and turning those pages. Laurie King’s series is, for my money, the best modern book adaptation of the Sherlock Holmes story. Her angle is the introduction of an assistant, the remarkable Mary Russell, who becomes Holmes’ partner both in investigative work and life. These books are not generally available in Australian bookshops, which I think is a great pity. I started on them when I was living the US, and now I’m back home get them via Book Depository, checking up every so often to see if she has produced another. This is the 13th in the series, and was published in 2015. Like any long series, it’s not necessarily quite what it was. The first half a dozen were exceptionally good, usually drawing in another major work of fiction (for example, Rudyard Kipling’s Kim) and treating the characters as real in the context of the book. The standard may have slipped a little, but they remain a highly entertaining series and Mary Russell is a formidable character. In this Mary and Sherlock are heading for Japan by ship and are drawn in to an extortion bid that involves a member of the British Peerage and the Japanese Emperor’s heir. Bring in ninjas, cruise ship life and Oxford’s Bodleian Library. I commend them to anyone who reads historical crime or Holmes tributes. King has many fans and has deservedly won a swag of major awards. 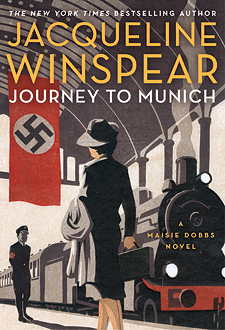 This is the 12th in the series featuring Maisie Dobbs, published in March this year. Maisie is about as British as it would be possible to get. Brought up in straitened circumstances early in the 20th century, she goes into service but finds a mentor who gives her an opportunity to use her brains and rise above a maid’s life. After studying, she sets up as a psychologist and investigator at a time when women did not typically do such work, but her calm, straightforward and intelligent approach gives her success. In this outing, she has returned to London after working as a nurse in the Spanish Civil War, where she was working out her grief after losing both her husband and unborn child. Her old contacts in the Secret Service ask her to go to Munich in 1938, where the Nazi Party’s power is rising and becoming more troublesome. She is to pose as the daughter of an important British industrialist, whose release has been arranged after two years in the Dachau prison camp for offering support to traitors. While she is there, she also intends to look up a young woman who has walked out on her husband and child, and whose parents are worried about what trouble she might be in. There are a couple of plot holes in this big enough to drive a tank through, but it is still a enjoyable story and perfect for a breezy read. I haven’t read all of the series, but I have read at least half, and all of the early ones. In the next, I understand Maisie is to reopen her business as a private investigator and move away from international intrigue, and I think that’s a good move for readers. This one is touted as the “American answer to Maisie Dobbs”, and that’s probably a fair call. 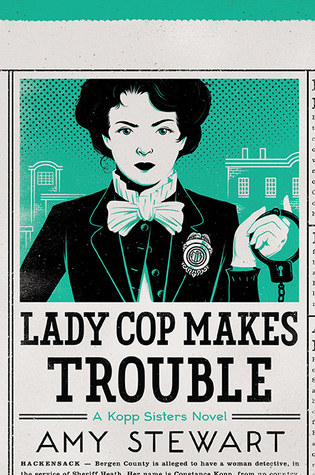 Constance is nowhere near as dignified and controlled as Maisie, but she is an independent and intelligent woman who has no desire to be “girly”, and who is perfectly able to look after herself, and deal with a criminal if necessary. This is the second in the series (I have not read the first), published in September this year. The angle here is that the heroine Constance Kopp is a real person, and the stories are, roughly speaking, true, in that they are based on news stories of the time, slightly embellished. Constance, who is orphaned and lives with (and supports) her sisters, is working with the Bergin County Sheriff in New York, hoping to get her Deputy’s badge. But when a prisoner she is in charge of escapes, she is demoted back to being in charge of the female prisoners at the jail. She is determined to track the man down, to show she is still worthy of being given the badge, and follows some less obvious routes to track down her man. This is a lot of fun, without every becoming too silly. Stewart is fairly new to fiction, but is an experienced author of non-fiction.